FaveCrafts is once again celebrating National Craft Month with this special gift, 13 Spring Crafts: Easter Craft Ideas, Spring DIY Home Décor, and More, filled with fun seasonal projects from some of the best craft companies and bloggers of today! In this eBook you’ll find projects from several well-loved companies, including American Quilter’s Society, Red Heart Yarns, Leisure Arts, Marvy Uchida, Polyform Products, and Sizzix! We’ve also gathered some fun spring projects from some of our top bloggers to help you get in the spirit of sunshine and flowers. 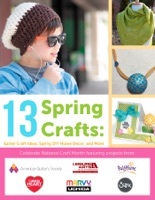 The ideas in 13 Spring Crafts cover a wide range of crafting mediums, so there’s bound to be something for everyone. Craft along with us as we celebrate creativity, imagination, and inspiration all season long with this special title.